Enjoy the VIP experience on this desert adventure. 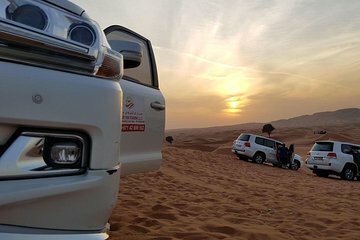 Ride into the desert in a well-appointed Land Cruiser before transferring to a specially equipped 4x4 vehicle for a “dune bashing” expedition. Take the time to snap some spectacular photos of the desert vistas before arriving at the majlis for an evening that features a barbeque buffet and live entertainment.